I am a writer of environmental fiction and non-fiction. I have published 18 previous books. I have completed 6 further books for which I am trying to find a publisher. I am a critic of sustainability and have developed the concepts of symbiosis and the symbiocene. I taught and researched at Australian universities for 25 years. I now live in Melbourne. 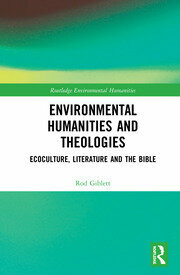 Environmental Humanities and Theologies is written by an ex-Christian who was born in Borneo of Australian Christian missionaries and who spent most of his childhood living in a Bible training institute where his father worked as the Registrar, lecturer in Church History and lay preacher. It is also written by a Taoist who discovered Taoism and Taoist Tai Chi (or they discovered me) over 35 years ago and who has been practising and playing both ever since. It is also written by a student of culture and literature for over 50 years. It stands on the shoulders of those giants who respect and value both spirituality and materiality, such as Walter Benjamin and Henry David Thoreau (perhaps unlikely comrades) and elders past and present of Australian Aboriginal cultures.